I've always been a big fan of Charlie and the Chocolate Factory. I read the book as a youngster, long before the original film came out, and liked it enough to read many other Roald Dahl books, including another of my favorites James and the Giant Peach. The original film, while not completely true to the book, was still a delight. It's a weird movie though, very quirky and odd, especially when watched through today's eyes. I'm also a big fan of Johnny Depp. He's a odd duck in reality, but a great actor nonetheless. And while Tim Burton has trouble with scripts, he's got a fantastic visual style with all his films, and so when I heard that Depp and Burton were teaming up on a remake of the classic film, I was stoked. The movie doesn't open until next week, so I can't yet comment on just how good or bad it is. 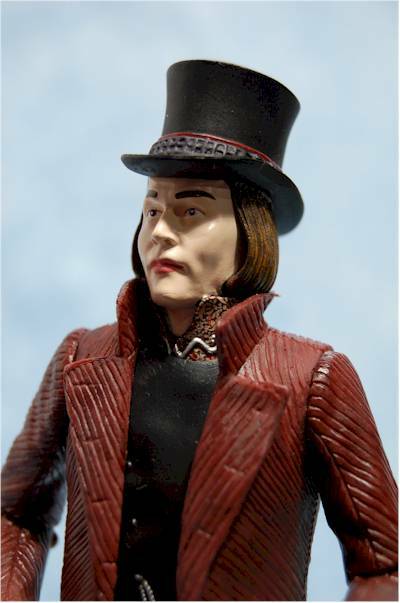 I have to admit that what I've seen of Depp's Wonka so far has me a tad scared. He looks like the love child of Michael Jackson and Liza Minnelli. But I'm willing to cut them some slack, and hope for the best. It should be no surprise that there are action figures to go along with the movie. If there are any surprises, it's that there isn't just a line aimed at kids, but a collector's 18" version from NECA, and even more surprisingly, a 12" version from Gentle Giant. 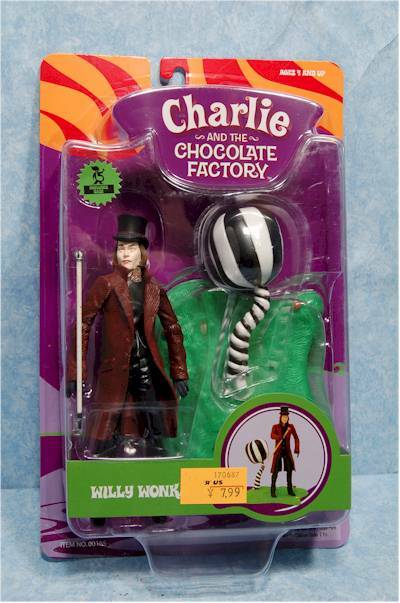 But tonight's review covers the Willy Wonka figure from the mass market line, produced by a new company - Funrise. The first wave of figures is now out, and should include Willy, Charlie, Mike Teevee, Veruca Salt, Violet Beauregarde, Augustus Gloop and some Oompa Loompas. Retail is around $8 each. I found Willy at Toys R Us, along with Charlie and Veruca. No sign of anyone else yet. Somehow they managed to make bright and colorful packages that are dull and uninteresting at the same time. The bubbles are huge as well, taking up much more space than necessary. At least they'll catch your eye on the peg. The sculpt is done by Gentle Giant, I believe. And while it's not God awful - certainly not as bad as early prototype photos indicated - it's still a long way from great. I've included a shot in the review of this Depp sculpt with the Jack Sparrow Depp from NECA, just in case you forgot what a fantastic Depp sculpt looks like. I don't mind that the figure is pale, since he's supposed to be, but there's no life in the sculpt, no expression, no emotion. I suspect that Willy Wonka will have some of those things on screen, and it's something that's seriously lacking here. The expression he does have is more zombie than eccentric chocolate mogul. You will be able to find Depp in there, but it's not the kind of work that you expect from Gentle Giant. The head, hat and collar are actually all one piece, with the neck joint down at the torso, at the bottom of the collar. This is an excellent example of a toy decision, that hurts the realism of the figure. Obviously, when you turn your head, the collar of your shirt doesn't turn with you. Willy looks a little odd at any angle other than straight on because of this. I'm cutting them a little slack there, since this is a mass market kids line, but at this price point, they still better be top notch. 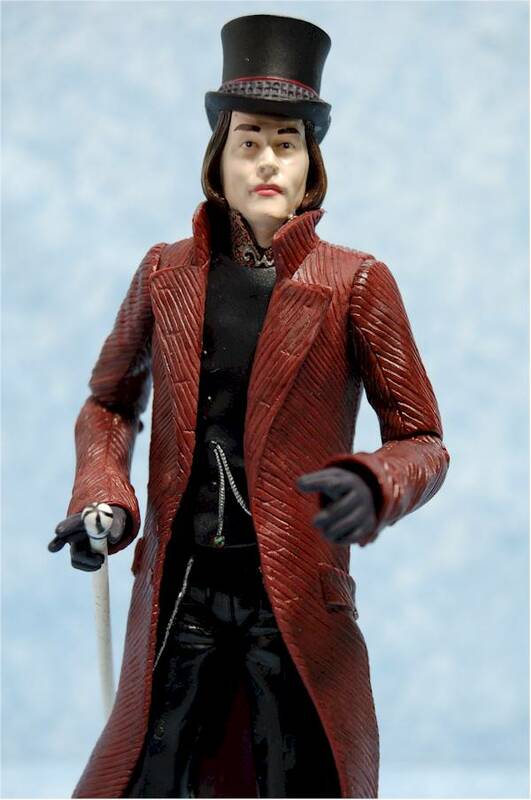 The sculpt on the body is slightly better, with some nice texturing and style, but I don't think that all that texture actually exists on the coat in the film. The sculpt and articulation work together fine (ignoring the whole neck situation), and Willy stands great on his own. The scale is 6", and fits in pretty well with other 6"- 7" figures. Willy himself is 6.5" tall to the tip of his hat. The hands are sculpted in far more expressive ways than the head - a conflict right there - and can hold the included cane nicely. The paint ops are decent, and just about on par for a mass market toy. The face is clean and neat, but the paint does nothing to help with the blank stare. The clothes have very little slop or bleed, and there's a decent range of color and small detail. The jacket is red, and not black like I've seen in all the trailers. Perhaps he does a costume change somewhere in the film...perhaps not. And isn't his hair black? Or am I just getting that color blind? I'm not dinging them on the color without seeing the film, but I have a bad feeling that it's simply incorrect. Willy has fairly standard articulation - neck, cut shoulders, pin elbows and knees, cut wrists, hips, and waist. The joints are intended for basic play and simple posing, and work on both counts. They are also fairly sturdy, but if the wrists are painted tight - like mine were - you should be extremely careful that you don't twist the pin too hard and snap it. 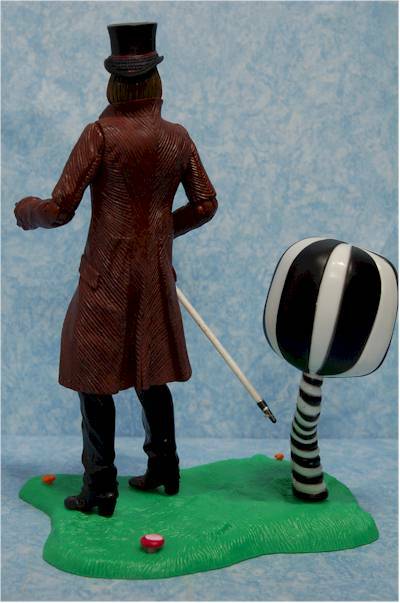 Willy comes with two main accessories - his candy scented base, and his cane. 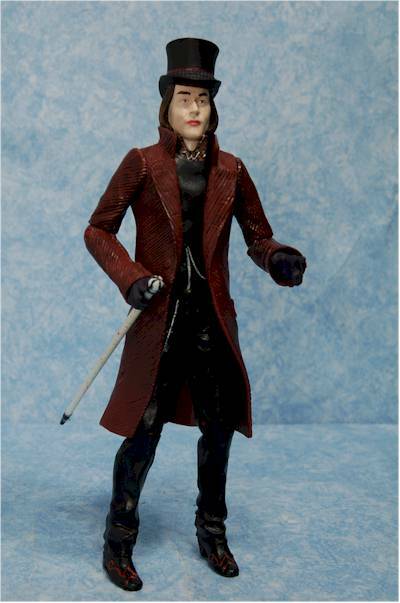 The cane fits in his hand easily enough, but lacks detail both in sculpt and paint. The same is true of the base, which screams dollar store. There's very little detail on the grassy section, and even less on the small mushroom like bumps. The candy scent may not actually exist. I remember them saying the bases would be scented back at Toy Fair, but I sure as hell can't smell anything. Not even that lovely 'new toy smell' that so often knocks you off your feet. There is a picture of what appears to be the gastrointestinal system of an Oompa Loompa on the package, with the words 'base included', but no mention of any scenting, good or otherwise. Rather than have a single set of Oompa Loompas, packing in one or two with every figure would have been a much better idea. Also, I suspect that there were plenty of other possible accessories for Willy from the film. Finally, if you're going to do a base for every character, make the bases interconnect. While the film is clearly for kids, action figures are just a bad idea. I doubt very much that any kids will be clamoring to act out scenes from the film, and you should never make 'action' figures (for kids) if the characters themselves don't do much in the way of 'action'. These are six dollar toys, tops. I have no idea how expensive the license was however, and since Funrise is a new company in action figures, perhaps their start up and manufacturing costs were higher than other folks. Still, kids and parents aren't going to care about such things, and all they'll see is a fairly hefty price tag. While the wrists are articulated, you should be extremely careful when you first twist them. Many will be painted tight, and twisting too hard to free them can break the peg. 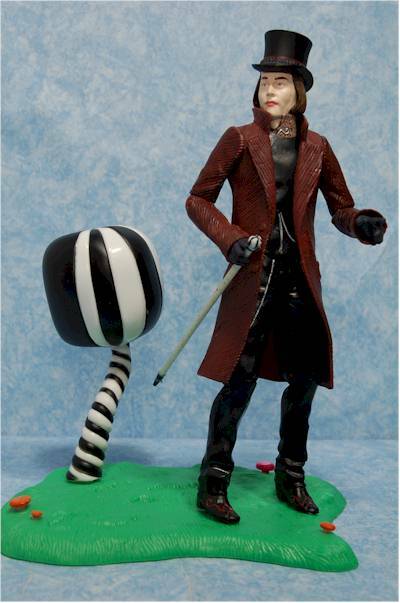 As a collector and fan of the original, I'd love to have a great Gene Wilder Willy Wonka on my movie character shelf. He had an amazing appearance in the film, and would stand out in a good way. I'm not sure at this point if I feel the same way about Depp's Wonka. Oh, he has a pretty interesting look alright, but not necessarily in a good way. And I'm not sure at this point if he's a worthy addition to the shelf. Still, it's nice to see a new company on the scene, and there's bound to be some growing pains for them as they get experience with the market. I am a little disappointed in Gentle Giant's work on the head sculpt, and might be more inclined to add him to the shelf if he didn't have such a blank, lifeless appearance. Interestingly enough, it's the Oompa Loompas that are more likely to be the winner out of this film and this set of action figures. Unfortunately, they didn't have any on the peg when I found these, but I'll be looking. Oh, yes, I'll be looking. - omgcnfo.com has the set of 7 for $48. - CornerStoreComics has the 16" for $35, and the GG version for $27. - Dark Shadow Collectibles has the 18" version for $32. - Amazing Toyz has the 18" version for $35. - Killer Toys has the 12" version for $25. - Alter Ego Comics has the 12" version for $25, and the 18" version for $38. 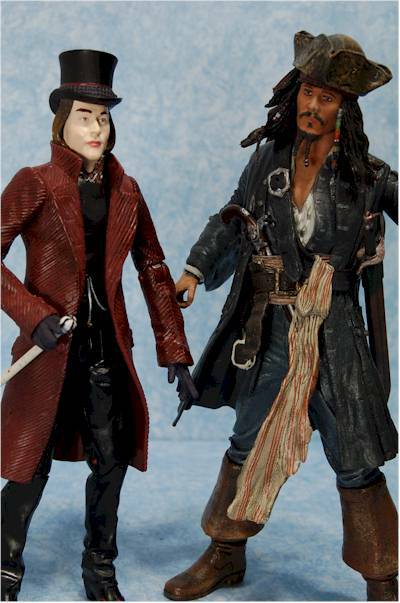 I couldn't come up with much...if you like Johnny Depp though, you can check out the review of his Jack Sparrow 6" figure, or his 18" version.